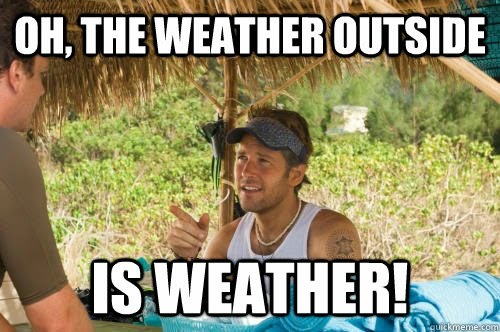 Talking about how hot, cold, rainy, windy, snowy it is outside. Granted you might just be informing friends from far away living in a vastly different climate than you are, but for the most part we're quite familiar with the seasons. When it's summer, it's hot outside. When it's winter, it's cold. Except when it's not in, in which case global warming is scary (and a far more interesting topic!). When it's spring, sometimes it's still cold and you're really pissed about it. I know. Your friends know. Let's talk about dinosaurs instead. Being so surprised when young people do awesome things. It's condescending. Amazing people do amazing things and age is rarely a factor. In fact, I think I did far more awesome things when I was 10 than I do now. Do you know how many books, drawings, songs and radio shows I created back then? A lot. Do you know how many I've created in my twenties? None. Negging. If you're unfamiliar, Urban Dictionary defines it as, "Low-grade insults meant to undermine the self-confidence of a woman so she might be more vulnerable to your advances." I'm told this technique is effective (and taught in a book called "The Game".. vom) and this bothers me very much, but not as much as it bothers me when guys try it on me. Needless to say, I am not receptive to it, but it recently came to me in an epiphany that I do not owe a random person who walked up to me at a bar anything. It is my first instinct to be sweet and friendly to a stranger who wants to talk, but I don't have to engage in a negative back and forth and neither do you. Next time someone strikes up a conversation with you and you find it to be insulting, just know that you can and should walk away. Defining people by the job that they do. Why is the first thing we ask when we meet people, "What do you do?" It's a way of putting people into boxes, and I didn't realize how much I resent it until recently. Next time you meet someone, do me a favor and ask, "What makes you happy?" instead. What does it matter what you do to make money unless that thing is also what makes you happy? I'm starting to think these two things don't have to be connected and therefore you shouldn't be defined by the less important one. Putting so much pressure on ourselves. Nobody has it all figured out and if they do, they're probably bored out of their minds. Enjoy the ride, my friends. PREACH GIRL. This post is fabulous. I am so with you on the hating on selfies and the former child star rants. Get over it folks. negging needs to go home and never come back to play. This post and these GIFS were beyond perfect! Your blog is just the cutest! I want to hug you after this one. You have life-etiquette figured out, my friend. Also, I can't think of a real life example of what negging is - What are this? Exactly! I love everything about this post! Amen to that Disney star thing! I was just talking to someone who was complaining about Selena Gomez's "Come and Get It" song. Hello! She is a grown woman! She is not going to be singing about wizards and magic until she dies. And the song isn't even explicit! Spot on! Also, we should stop shaming people for checking their phones at dinner. Unless their dinner date has no phone and is relying solely on the company to be entertained.... But getting a notification and checking it is not a crime! Even at dinner.